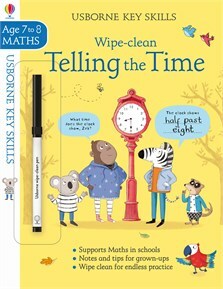 Part of the Usborne Key Skills series that supports the maths lessons children learn at school, this entertaining book is filled with activities that build confidence in telling the time to the hour, half hour, quarter past and quarter to. Wipe-clean pages offer endless practice, and answers and secret notes for grown-ups are at the back. Holly Bathie grew up in Devon, where she spent all her time reading rather than going outside in the fresh air. After university, she moved to Oxford to briefly work in the theatre before moving to children’s publishing. Until the age of 7 she wanted to be an acrobat, a lollipop lady, a lawyer or a comedienne before deciding the best job would be to create Usborne books, so she is thrilled to be finally doing it! In her spare time she enjoys all kinds of dancing and performs with an amateur theatre group.